Latvia is country with a high level of internet expansion in population. Now anyone interested in internet connection in Riga Jurmala Latvia has a few cheap options to connect to internet. In Riga, Jurmala, Latvia developed such kinds of the internet as ADSL internet, broadband cable internet, a network of free and fee-based Wi-Fi wireless access points to internet, WiMAX and modern mobile internet, which provides access to internet anywhere in Latvia. Internet Market in Latvia is liberalized. More than 200 companies-providers (ISP) may offer access to the internet in Riga, Jurmala and Latvia. Mobile telecoms in Latvia provide highest quality of moble communication and all three mobile telecoms TELE2, BITE, LMT offer the service of mobile internet for your phone or computer. For computer You will get 3G modem at the mobile operator's offices in Riga, Jurmala or another city in Latvia and use high speed internet anywhere in Latvia. You can use mobile Internet is boundless for small monthly fee or may pay for internet at a low price only for the actually spent Mb, without obligations, contract and bills! And at night you will be able to use mobile Internet for free. In addition to mobile telecoms mobile internet in Riga, Jurmala and Latvia is offered by Triatel, IZZI and Lattelecom with WiMAX Internet. 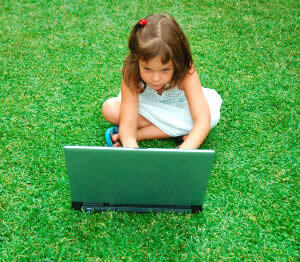 Network of Wi-Fi wireless Internet free-of-charge is growing in Riga Jurmala and in all Latvia rapidly. Additional devices are not necessary to use WiFi wireless Internet. All notebooks, smart-phones, iPads connect to numerous free Wifi internet access points in Jurmala Riga Latvia without problems. Already in many restaurants, cafes, petrolium stations, shopping centers and other state and public buildings in Riga Jurmala and in all Latvia cities there is an opportunity to connect to wireless Wifi internet free of charge. You may look the information and the map of free Wifi points internet in Riga, in Jurmala and in other cities of Latvia on this site. In addition, many latvian citizens and organisations in Riga Jurmala Latvia use wireless internet without password. So you may easily catch free internet on streets of Riga, Jurmala, cities of Latvia. 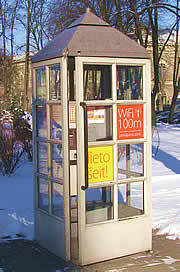 Network of public payphones Lattelecom (look picture) is widely spread in Jurmala Riga Latvia. Within 100 m distance payphones offer Wi-Fi wireless internet for fee (for more details look here. Lattelecom also provides wireless internet in Riga Airport for good price. Wifi internet can only be used in small space, but with mobile internet you will be free in your plans and internet will always be with you. In our Jurmala Hotel Concordia you can also enjoy unlimited Wi-Fi Internet for free. Here you can send e-mail, visit websites and blogs, talk in Skype and social networks, find needful information in Internet, read news and have fun! Broadband Cable is the most popular type of internet connection in Riga, Jurmala and Latvia. Broadband cable provide internet connection as well as television and phone communication. 3 in 1 - internet, tv, phone. Internet Market in Latvia is liberalized. More than 200 companies-providers (ISP) offer access to the internet in Riga, Jurmala and in other cities of Latvia. Some telecoms offer internet and television via fiber-optic communication that provides the best speed and quality in data transmission.